Finding a talent agent who will help your media career involves more than doing an Internet search or making a single phone call. Once you consider the pros and cons of hiring a talent agent, ask yourself some critical questions before choosing an agent. Deciding to find a talent agent can boost your media career. You just have to know what you're getting into first. 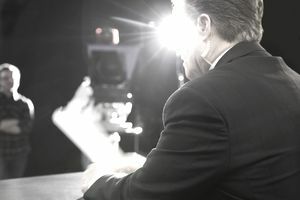 You may dream of being a million-dollar star news anchor on one of the broadcasting networks. Or your goal may be to become the best-known TV reporter in your hometown. Someone who wants to get to the network will likely have to criss-cross the country, building a career at stations in progressively larger DMAs. A talent agent can help you find and get jobs in unfamiliar cities where he has contacts. But if you want to stay close to home, investigate whether an agent is worth the trouble. Chances are, you'll know the people at the TV stations better than he will. A talent agent may not be very interested in helping someone who wants to stay put. That reduces his ability to make money. Will You Get Personal Attention? If you are handing over 5% to 10% of your salary, you deserve to get personal attention from your talent agent. But there are some agents who serve dozens of clients. That may mean they have little incentive to get to know you. What's worse, some agents have a reputation of pitching several clients for the same job opening. It's true that some stations may have a preference for a certain physical appearance in their next hire, so an agent is presenting several people. But that agent is forcing you to compete with several of his clients when you're expecting him to tell a TV news director that you are the one for the job. Maybe the personal attention you seek is not in finding a job, but in negotiating your contract. In that case, it may not matter how many clients an agent has, just as long as you can get him on the phone when it's time to sign a deal. Remember, most agents charge less if all they do is work the deal, versus finding you the job. Are Your Skills Ready for a Talent Agent to Market? A 22-year-old college graduate may want a talent agent, so she can brag to all her classmates that she's made it in the media business. That mindset will likely lead to disappointment. A talent agent is constantly juggling clients across the country. Some will be a high-priced talent who can command the attention of top station and network executives, while others will be tomorrow's up-and-coming stars. A rookie reporter will have a hard time fighting for an agent's attention, even if she does get signed. If she lands a job with a $30,000 contract, she could give up $3,000 to her agent. That's a lot of money to her, but not a lot to him. It's best to have a few years of experience so that the agent has a solid resume of performance to use in finding that person a new job. Some agents will offer to critique your work. But if your station has a TV consultant, you can get the same advice for free. Before you jump at the chance to sign with a talent agent, check references, ask a lot of questions and try to negotiate the terms of payment. If it sounds like you're hiring somebody, you are. The time you spend considering your options will help you make the best choice -- including deciding if you need an agent at all.